Summer’s featured ingredient is bananas! Bananas are a favorite fruit all over the world, not only as a sweet snack, but as a savory food stable, and a slippery source of comedy. Bananas are believed to have been first domesticated in Papua New Guinea and Southeast Asia, possibly as early as 8000 BCE. Bananas were introduced to the Americas by Portuguese sailors who brought the fruits from West Africa in the 16th century. The word banana is of West African origin. 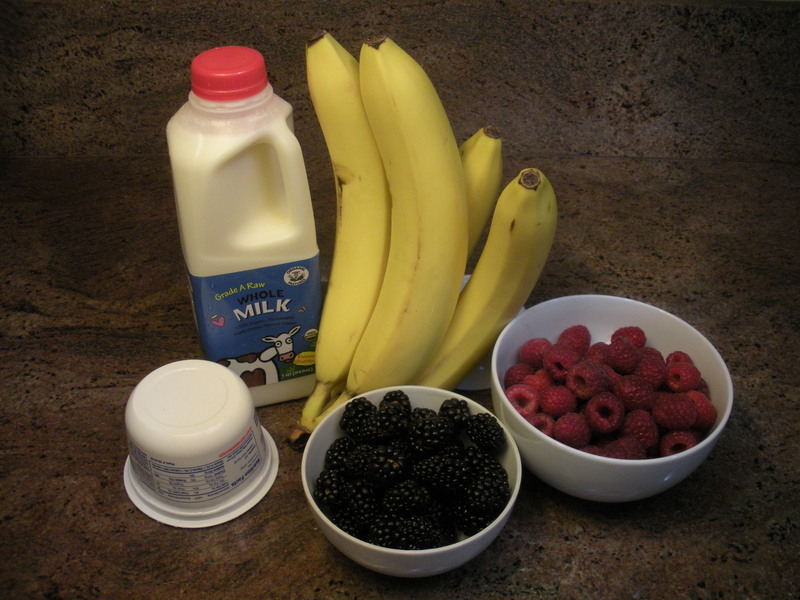 In the US, the cultivar primarily available is the Cavendish banana. It was chosen for its ease of transport and shelf life. Asian markets however usually have a variety of bananas available. The top 4 producers of bananas in the world are commonly India, Uganda, China, and the Philippines. The top 4 exporters are commonly Ecuador, Costa Rica, Colombia and the Philippines. 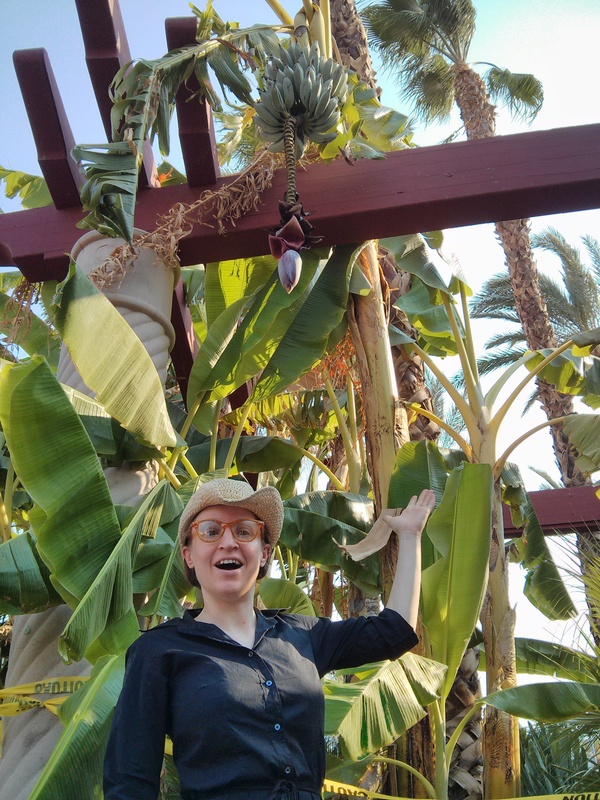 During the ripening process, bananas produce a plant hormone called ethylene, which stimulates the formation of amylase, an enzyme that breaks down starch into sugar, making the bananas taste sweet. The green, less ripe bananas contain higher levels of starch. In the US, man-made ethylene is used to ripen the green bananas, which are easier to transport. Ethylene also signals the production of pectinase, an enzyme which breaks down the pectin between the cells of the banana, causing the banana to soften as it ripens. Bananas are eaten many different ways all over the world. Bananas can be eaten raw, flambéed, deep fried, baked in their skin, or steamed in sticky rice wrapped in a banana leaf. They can also be made into jam, chips, or flour. Backpackers in South Asia often follow the Banana Pancake Trail. This is the nickname for the many growing routes lined with guesthouses, cafes and restaurants catering to backpackers which serve banana pancakes for breakfast. Many tropical populations eat green bananas and plantains as a staple starch, which taste similar to potatoes. They are simmered in stews and curries, fried, baked or mashed. Banana plant hearts are used much like artichokes. They are eaten raw, steamed with dips, or cooked in soups, curries and fried foods. Banana leaves are large, flexible, and waterproof. In a downpour, they can be used as umbrellas. In South Asian and Central American countries, they are often used as a wrapping to steam or grill food, or as plates. In India, leaves are dried and used as packing material and cups. Alternate Production Method 1: Ice Cream Maker Upside: An ice cream maker eliminates the need to freeze the frozen yogurt base into cubes. 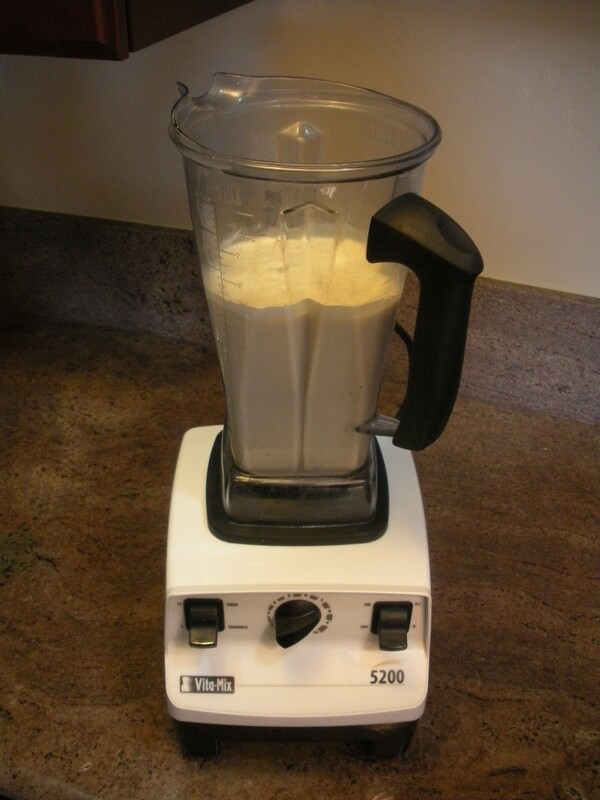 Simply pour blended base into the ice cream maker, and follow its instructions. 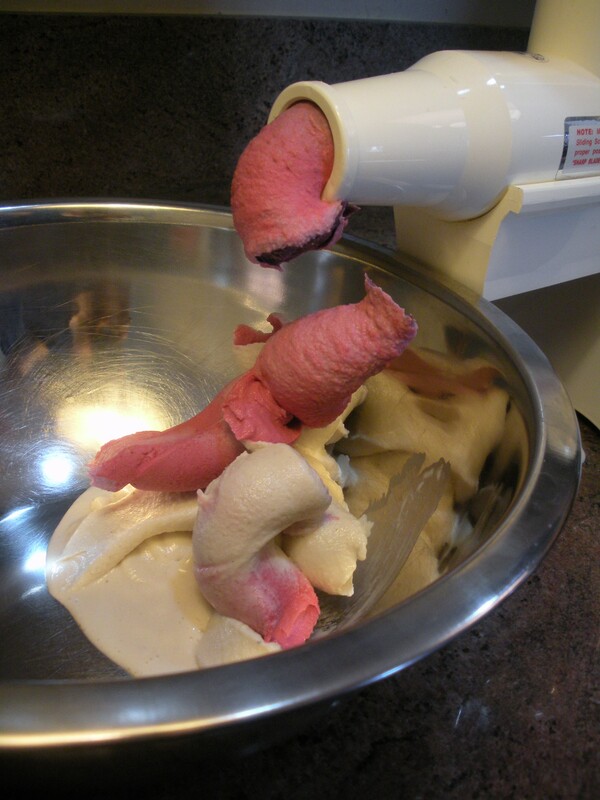 Downside: An ice cream maker eliminates the ability to add swirls of berries or other fruits into the yogurt. Alternate Production Method 2: Blender While a Champion juicer produces the optimal frozen yogurt texture, a good blender will also do the trick. Place frozen yogurt mix cubes (and optional additional frozen fruit chunks) into blender in batches and blend into snowy shavings. Important: Do not add a liquid, as it will cause the cubes to stick together and prevent efficient blending. Scoop shaving into serving dish. Add toppings if desired. Enjoy! 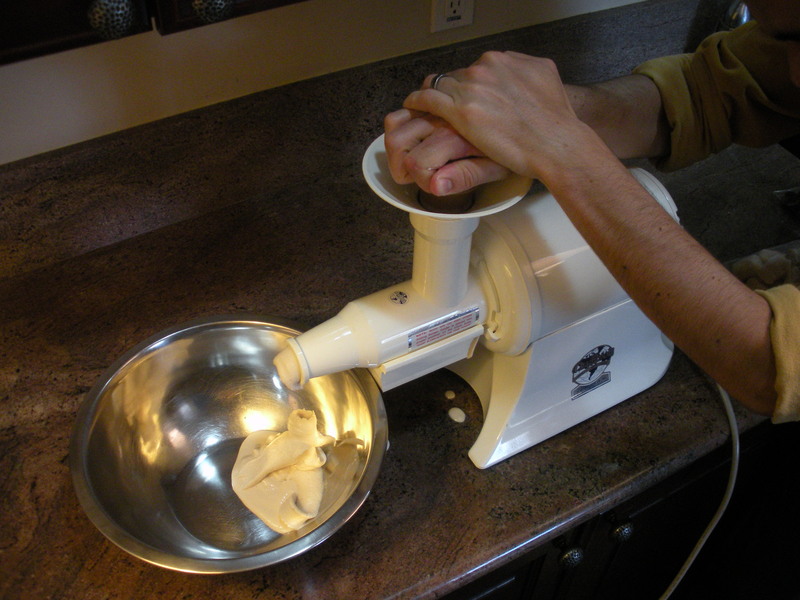 Elvis-style Variation: While processing the frozen yogurt base cubes through the juicer, periodically add large spoonfuls of peanut butter. Top frozen yogurt with sliced bananas, more peanut butter, and a drizzle of honey. 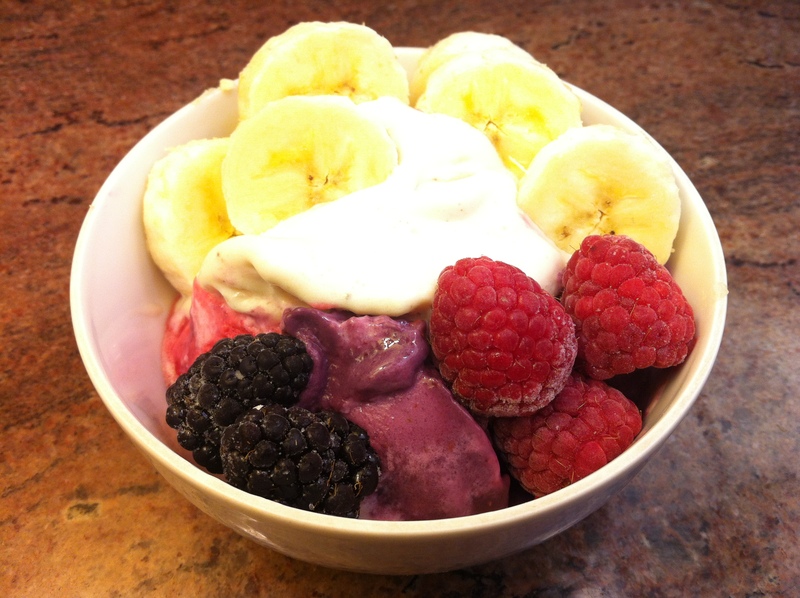 Banana Split Variation: Split 1 peeled banana lengthwise and set in a serving bowl. 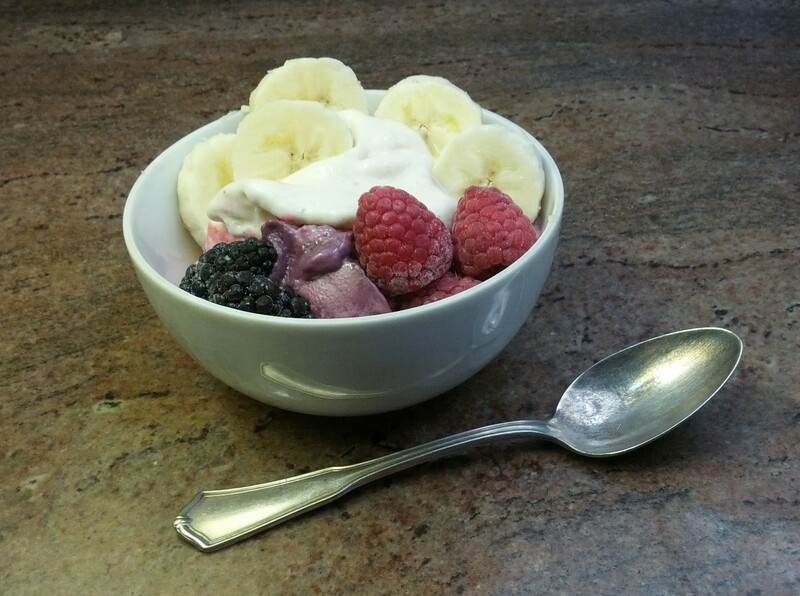 Spoon frozen yogurt over banana. Top with favorite toppings, traditionally chocolate sauce, whipped cream, cherries and nuts. 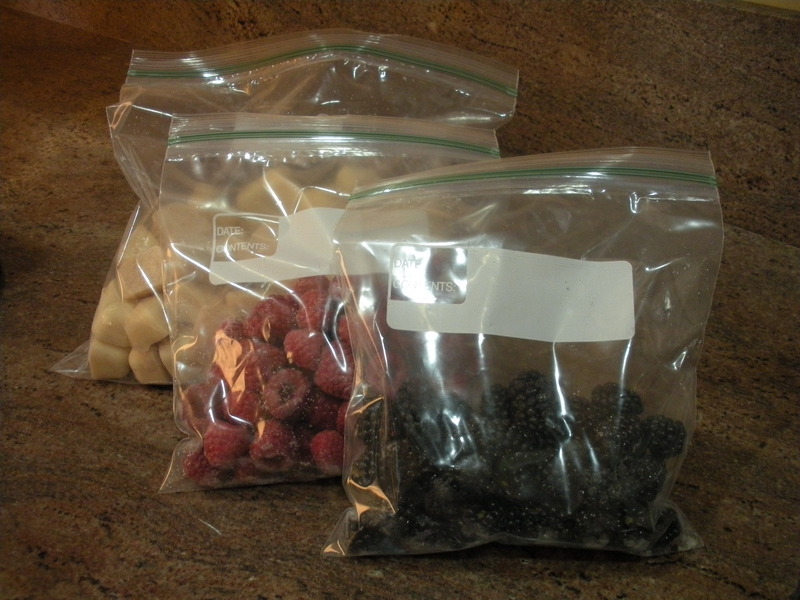 Freezer bags or containers for yogurt base cubes, and optional frozen fruit swirl-ins. 1. 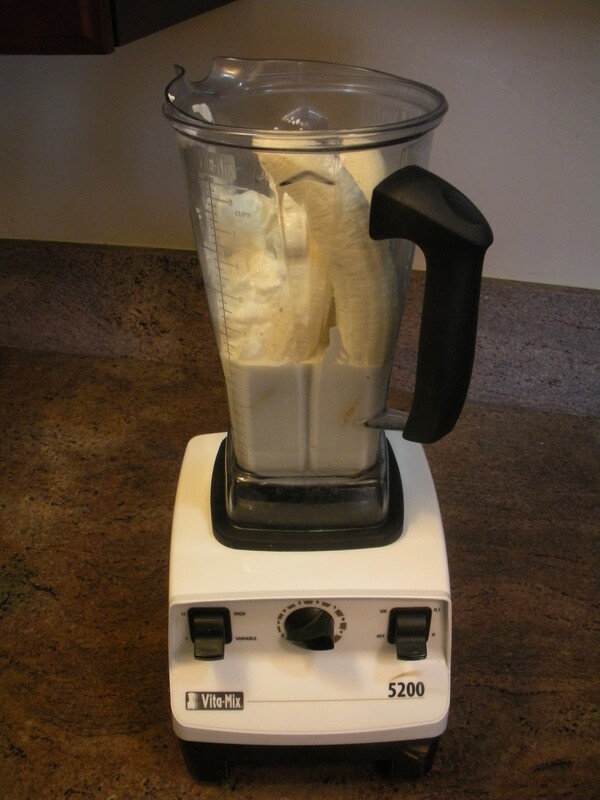 Place bananas, milk, yogurt, and optional vanilla & salt in blender. 3. 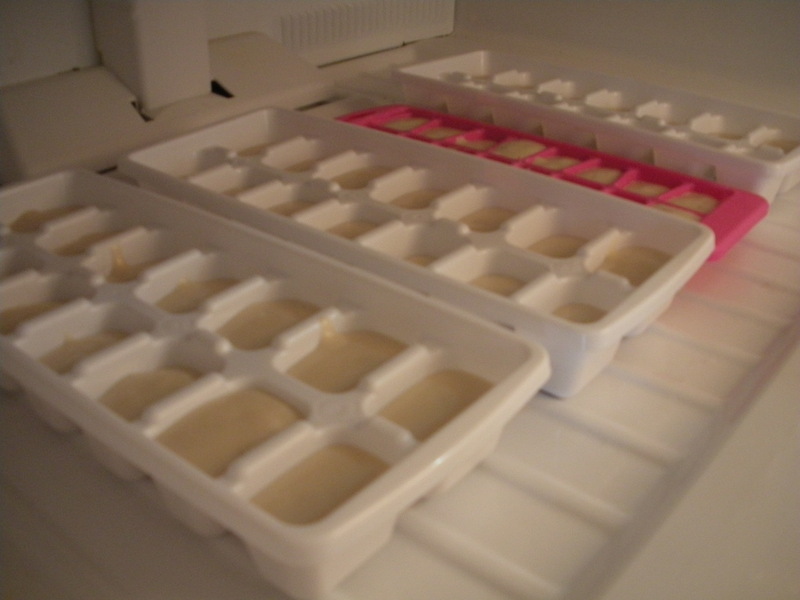 Pour frozen yogurt base into ice cube trays. Leave a little room, so that when the cubes freeze and expand, they will still fit in the mouth of the juicer. 4. 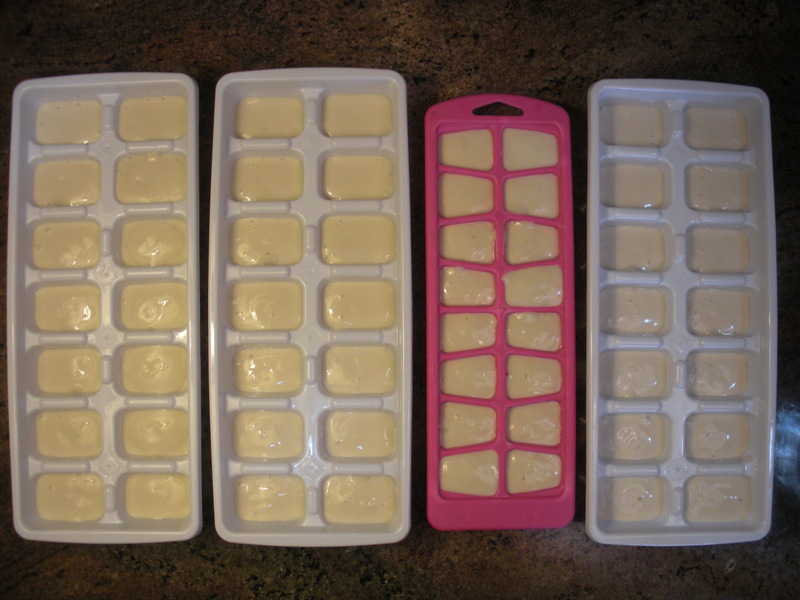 Freeze cubes until solid. 5. If not immediately making soft serve, place cubes (and optional frozen fruit swirl-ins) in freezer bags or containers to protect from roaming freezer flavors. 6. 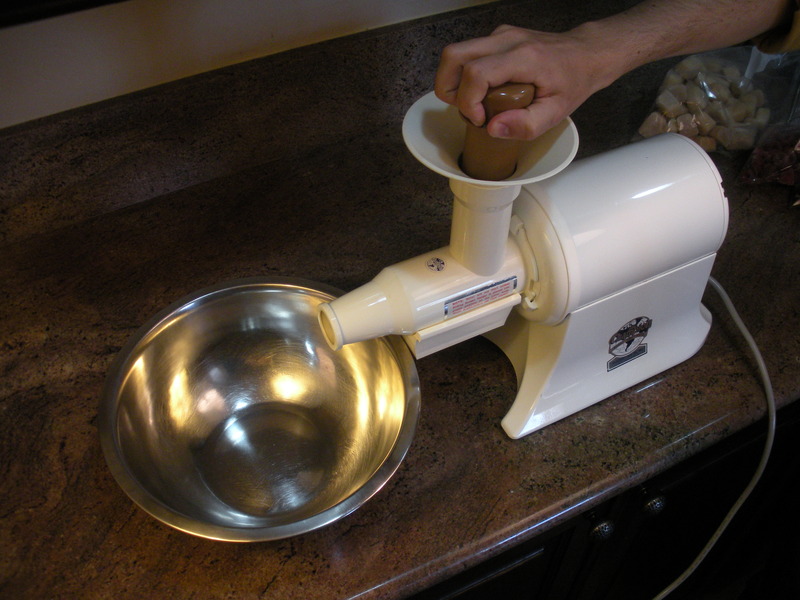 Assemble juicer. Place large bowl under exit spout. Remove ingredients from freezer. Turn juicer on and add several cubes. Push cubes through blender. Spoon into bowls, garnished with optional toppings. This is the most amazing and educational website! I never knew there was so much to learn about bananas!